I don’t know about you, but October is probably one of my favorite months of the year. October is the month in Texas where we finally start getting cooler weather, it is the month that starts the festivities of the holiday season (Halloween, Thanksgiving, Christmas, then New Years), and it is the month where I can enjoy making festive, aromatic, fall treats like pumpkin bread, pumpkin pie, and today, pumpkin granola. I found this extremely easy and tasty granola recipe from Peanut Butter Fingers (PB Fingers). If you have not heard of this blog, you must take a look….it is one of my favorite food/health blogs on the Internet. If you like granola, you might want to check out PB Finger’s other flavors such as nutella, peanut butter, cinnamon, and almond butter granola under her snack recipes section. 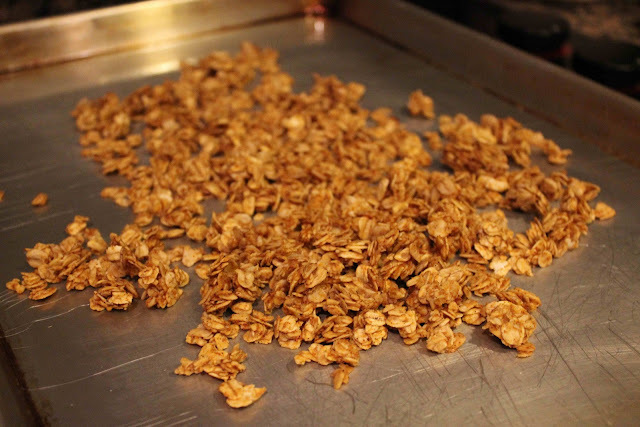 Like I said, this granola was super easy to make and only involves 5 ingredients, most of which you will have at home. The recipe says to bake the granola for only 15 minutes, but I would suggest upping the time to 20-30 minutes for a crunchier granola….this granola was chewy (but still delicious). I like to sprinkle pumpkin butter granola on vanilla or Greek yogurt, oatmeal, swiss oatmeal, or just eat it plain. By the way, Pumpkin Butter is not “fatty” like it sounds. Like jam, it has 0 grams of fat and only 35 calories per serving. I LOVE Pumpkin Butter! 6 Responses to "Pumpkin Butter Granola"
LOOKS GOOD FROM KIEV AT THE AIRPORT. It also looks good from London Heathrow as well this morning. Looks good in Texas too! I wanted to make this but despite being fall, there was no pumpkin butter at the grocery store! Instead I made it with apple pecan butter and it was amazing! Jenny, wow, what a great combination! I’ll have to try that myself!